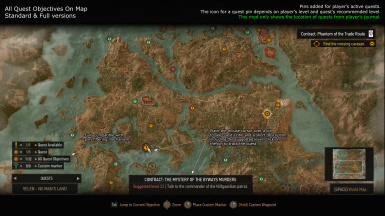 Shows on map all objectives for all player's active quests. Like tracking multiple quests in the same time. You can also change the currently tracked objective without going to the Quests menu. Optionally can cache the location of discovered merchants. Bug fix (full version only): the cached dye and wine merchant pins (from Blood and Wine expansion) had no label and description. Thanks to wghost81 for helping fixing the bug. Updated for game version 1.30. Bug fix: for at least a quest the mod was showing invalid pins. Thanks to wghost81 for finding the bug. Lite version won't fail silently anymore if there's a conflict with another mod that changes mapMenu.ws script file. Bug Fix: in NG+ a wrong recommended level was displayed for some quests. By default the FULL version doesn't cache anymore the pins for wandering merchants. Now the mod is compatible with patch 1.12. Improved again the code to avoid caching the same merchant pin multiple times. Added the possibility to ignore the wandering merchants (CACHE_WANDERING_MERCHANT_PINS setting). Added two sets with custom icons. The icons from a set have different colors. The icon used for a quest depends on player's level and quest's recommended level. The quest pins are now always displayed over other icons. The list with pins in Filters panel is by default sorted alphabetically. The quest pins can be hidden from Filters panel. Changed the default icon used for quest pins to an white exclamation mark. Bug fix: no merchant pins were cached / updated while sailing or riding a horse. Bug fix: the mod was ignoring the filtering mechanism. Added a limit for the maximum number of merchant pins that can be cached. Improved the code a little bit to avoid caching the same merchant pin multiple times. Added a notification message when a cached merchant pin is removed. Bug fix: for some quests no pin was shown on map. Bug fix: cached merchant pins are now shown only if there's no other similar pin in that location. Few other minor tweaks & fixes. The mod has 3 versions: LITE, STANDARD and FULL. Added the possibility to change the currently tracked quest (or objective) directly from map. No need to go to Quests menu for this. Added caching for merchant pins. First release for patch 1.11. 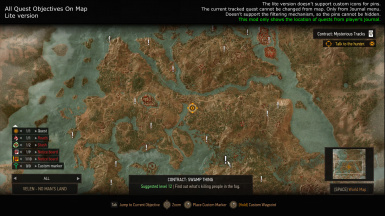 Shows on map all objectives for all player's active quests. See the screenshots for details. See wmkMapMenu.ws file for some settings. This mod doesn't show the location of quests the player doesn't have in journal. Install it like any other Witcher 3 mod. Compatible with Nexus Mod Manager. Use Script Merger to detect and solve any conflicts with other installed mods. See the downloads page for a fix for some generic merchants: sometimes is impossible to view their inventory and they don't have a pin on map, even if the player is close. Also a wrong model may be used during the dialog scene. Is a must have if you use the full version of All Quest Objectives on Map mod, otherwise it won't save the map pins for bugged merchants. See the README.txt file included in the archive for more details. If the scripts fail to compile with errors about AddSessionTag, LogWithName, LogWithValue, LogWithLabel, LogWithLabelAndValue etc... functions then you have an old telemetryKeyword.ws script file. Or you don't have the file. See the MISCELLANEOUS section from downloads page for a fix. Shows the location for all player's active (not finished, not failed) quests. I don't recommend this version and instead you should use the standard one. Install it only if you also use a mod that changes panel_worldmap.redswf file, but currently there are very few. For more details see the COMPATIBILITY section below. This version doesn't support custom icons for quest pins and instead uses an white exclamation mark as icon! Adds only few new lines in mapMenu.ws file. Easy to merge if there's a conflict with another mod. Supports custom icons for quest pins. Click on a quest pin to change the currently tracked quest (or objective) directly from map. Compatible with pin filtering mechanism (the pins can be hidden, they appear in Quests category etc...). Adds more changes to mapMenu.ws file than the lite version and also changes the panel_worldmap.redswf file. 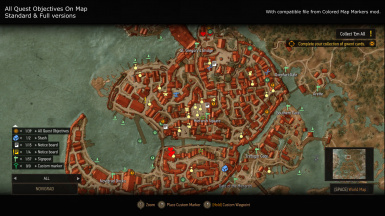 By default some merchants are visible on map only when the player is close to them. This version saves their location and adds the missing icons when the map is opened. Works only for merchants discovered after the mod is installed. You can click on a cached / saved pin to remove it. The list with discovered merchants is not lost when the game is restarted. By default the wandering merchants are ignored and their location is not saved, but this is configurable. Note that the solution is not perfect and in some cases the mod may add a pin for a merchant that already has one. This usually happens for the merchants that are involved in quests, like Keira Metz or The Pellar, when they change their location. Cannot fix this, but happens rarely and you can remove the duplicated pins without problems. Changes few more files than the lite and standard versions. Also changes panel_worldmap.redswf file. The standard and full versions are incompatible with any other mod that changes the panel_worldmap.redswf file because merging is not possible. The only exception are the mods that provide a compatible version, like Colored Map Markers by DJ_Kovrik. Read their description for more details. Incompatible mods: currently I don't know any other mods that change the same SWF file. The lite version is fully compatible with the main file from Colored Map Markers by DJ_Kovrik. For standard and full versions you must install the compatible file from Colored Map Markers, instead the main one. If you use mod.settings file to manually set mod priorities, make sure that Colored Map Markers has higher priority (as it is by default). If you use Script Merger and want to have a clean conflicts panel you may remove the blob0.content and metadata.store files from this mod (not recommended). Don't install the compatible file from Colored Map Markers with the lite version! Use the main file, otherwise you won't be able to fast travel. By default the coordinates for pins are always retrieved when the map is opened. For slower computers I've implemented a caching mechanism that is disabled by default. Actually I don't know if caching makes any difference. To enable it change the CACHE_PIN_POSITIONS setting to true. Do this only if the map loads slower for you, otherwise leave it disabled. You may also like Action Log and More Quick Slots mods.